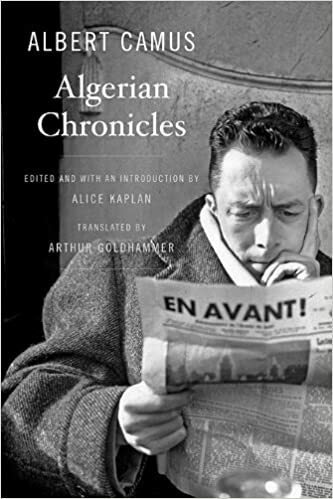 More than fifty years after Algerian independence, Albert Camus "Algerian Chronicles" appears here in English for the first time. Published in France in 1958, the same year the Algerian War brought about the collapse of the Fourth French Republic, it is one of Camus most political works an exploration of his commitments to Algeria. Dismissed or disdained at publication, today "Algerian Chronicles, " with its prescient analysis of the dead end of terrorism, enjoys a new life in Arthur Goldhammer s elegant translation. Believe me when I tell you that Algeria is where I hurt at this moment, Camus, who was the most visible symbol of France s troubled relationship with Algeria, writes, as others feel pain in their lungs. Gathered here are Camus strongest statements on Algeria from the 1930s through the 1950s, revised and supplemented by the author for publication in book form. In her introduction, Alice Kaplan illuminates the dilemma faced by Camus: he was committed to the defense of those who suffered colonial injustices, yet was unable to support Algerian national sovereignty apart from France. An appendix of lesser-known texts that did not appear in the French edition complements the picture of a moralist who posed questions about violence and counter-violence, national identity, terrorism, and justice that continue to illuminate our contemporary world." have hitherto lived under a particular form of repression. 2. Some 1,200,000 French natives of Algeria have a right to live in their homeland and cannot be left to the discretion of fanatical rebel leaders. 3. The freedom of the West depends on certain strategic interests. Then the French government must make it clear that: 1. It is disposed to treat the Arab people of Algeria justly and free them from the colonial system. 2. It will not sacrifice any of the rights of the French of Algeria.